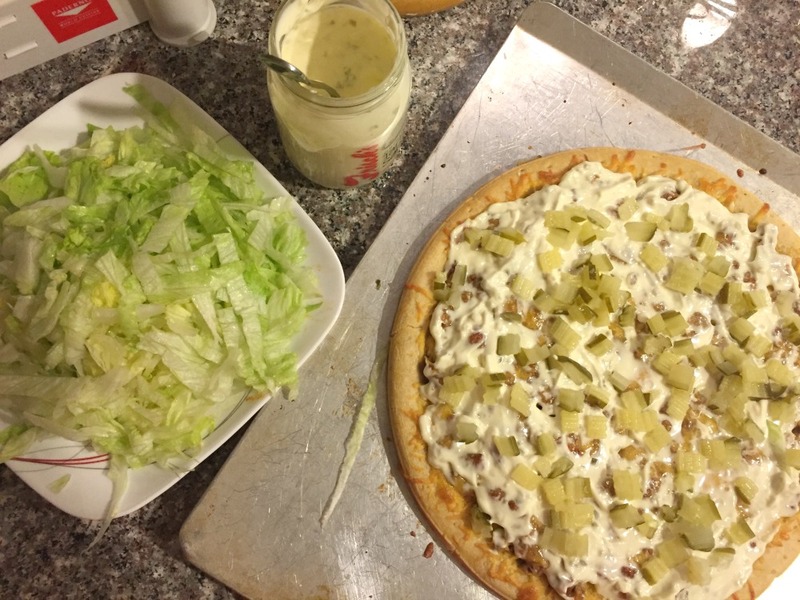 1/2 cup Frisch’s Famous Tartar Sauce – Again…we like tartar sauce. This is open to your interpretation – just do what feels right. Preheat oven according to your pizza crust package instructions. Add the onion and ground beef to a skillet set over medium high heat. Brown the ground beef, crumbling it as fine as possible as you go. When it’s brown through, drain off any excess fat and return the skillet to the heat. Add the tomato sauce, garlic powder, onion powder, and salt and simmer on low heat for 5-10 minutes. Place pizza crust on a pizza tray or baking stone. Top crust with ground beef mixture. Cover with shredded cheese and place in preheated oven. Bake according to pizza crust package directions (ours baked at 375 for 8-10 minutes) or until cheese is melted and bubbling slightly.